Now, a team led by scientists in the Nuclear Science Division at the Department of Energy’s Lawrence Berkeley National Laboratory (Berkeley Lab) has enlisted powerful supercomputers to calculate a quantity known as the “nucleon axial coupling,” or gA—which is central to our understanding of a neutron’s lifetime—with an unprecedented precision. Their method offers a clear path to further improvements that may help to resolve the experimental discrepancy. Illinois Physics alumnus Chia Cheng “Jason” Chang is lead author on the paper. 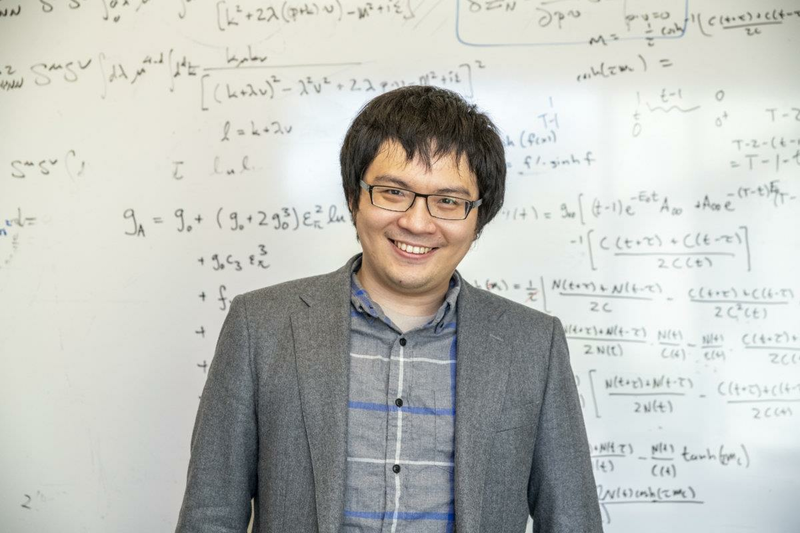 Chang received his bachelor’s degree in 2008 and his doctoral degree in 2015, both from the Department of Physics at the University of Illinois at Urbana-Champaign. Chang’s doctoral adviser at Illinois was Professor Aida El-Khadra. These results were achieved while Chang was a postdoctoral researcher in Berkeley Lab’s Nuclear Science Division. Chang currently holds an appointment as a research scientist at the Interdisciplinary Theoretical and Mathematical Sciences Program (iTHEMS) of the Institute of Physical and Chemical Research (RIKEN), Japan. To achieve their results, the researchers created a microscopic slice of a simulated universe to provide a window into the subatomic world. Their study was published online May 30, 2018, in the journal Nature. The nucleon axial coupling is more exactly defined as the strength at which one component (known as the axial component) of the “weak current” of the standard model of particle physics couples to the neutron. The weak current is given by one of the four known fundamental forces of the universe and is responsible for radioactive beta decay—the process by which a neutron decays to a proton, an electron, and a neutrino. In addition to measurements of the neutron lifetime, precise measurements of neutron beta decay are also used to probe new physics from beyond the standard model. Nuclear physicists seek to resolve the lifetime discrepancy and augment with experimental results by determining gA more precisely. 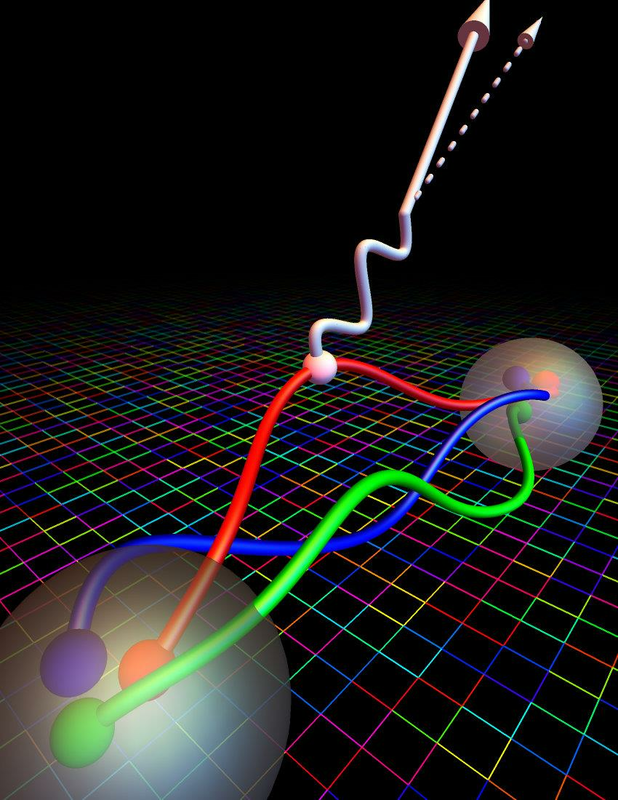 The researchers turned to quantum chromodynamics (QCD), a cornerstone of the standard model that describes how quarks and gluons interact with each other. Quarks and gluons are the fundamental building blocks for composite particles including neutrons and protons. The dynamics of these interactions determine the mass of the neutron and proton, and also the value of gA. While a type of mirror-flip symmetry in particle interactions called parity (like swapping your right and left hands) is respected by the interactions of QCD, and the axial component of the weak current flips parity—parity is not respected by nature (most of us are right-handed, for example). And because nature breaks this symmetry, the value of gA can only be determined through experimental measurements or theoretical predictions with lattice QCD. The team’s new theoretical determination of gA is based on a simulation of a tiny piece of the universe—the size of a few neutrons in each direction. They simulated a neutron transitioning to a proton inside this tiny section of the universe, in order to predict what happens in nature. “We now have a purely theoretical prediction of the lifetime of the neutron, and it is the first time we can predict the lifetime of the neutron to be consistent with experiments,” asserts Chang. “This was an intense 2 1/2-year project that only came together because of the great team of people working on it,” remarks Walker-Loud. This latest calculation also places tighter constraints on a branch of physics theories that stretch beyond the standard model—constraints that exceed those set by powerful particle collider experiments at CERN’s Large Hadron Collider. But the calculations aren’t yet precise enough to determine if new physics have been hiding in the gA and neutron lifetime measurements. “We don’t have to change the technique we’re using to get the precision necessary,” Walker-Loud states. 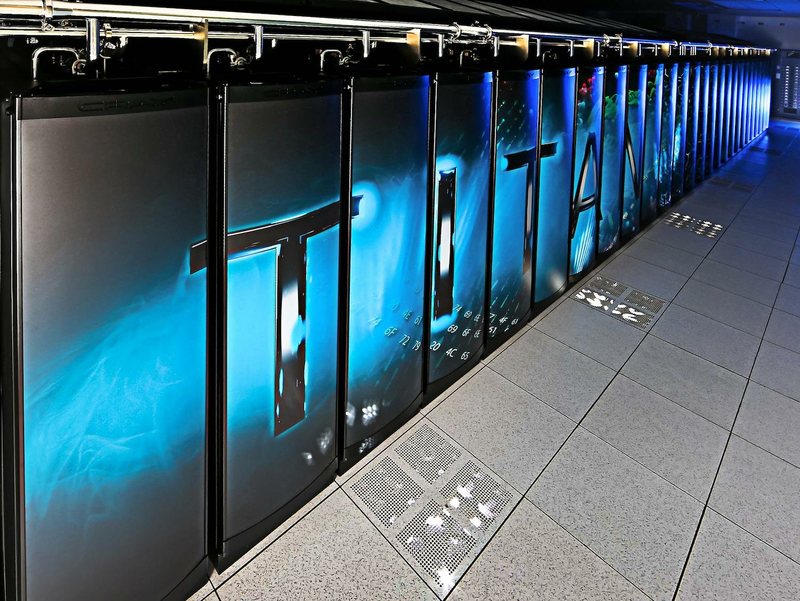 The team drew heavily upon the power of Titan, a supercomputer at Oak Ridge Lab equipped with graphics processing units, or GPUs, in addition to more conventional central processing units, or CPUs. GPUs have evolved from their early use in accelerating video game graphics to current applications in evaluating large arrays for tackling complicated algorithms pertinent to many fields of science. The axial coupling calculations used about 184 million “Titan hours” of computing power—it would take a single CPU about 75,000 years to work through the same set of calculations. “Establishing a new way to calculate gA has been a huge rollercoaster,” Walker-Loud comments. Rutgers University, the University of Washington, the University of Glasgow in the U.K., NVIDIA Corp., and Thomas Jefferson National Accelerator Facility. The work was supported by Laboratory Directed Research and Development programs at Berkeley Lab, the U.S. Department of Energy’s Office of Science, the Nuclear Physics Double Beta Decay Topical Collaboration, the DOE Early Career Award Program, the NVIDIA Corporation, the Joint Sino-German Research Projects of the German Research Foundation and National Natural Science Foundation of China, RIKEN in Japan, the Leverhulme Trust, the National Science Foundation’s Kavli Institute for Theoretical Physics, DOE’s Innovative and Novel Computational Impact on Theory and Experiment (INCITE) program, and the Lawrence Livermore National Laboratory Multiprogrammatic and Institutional Computing program through a Tier 1 Grand Challenge award. The conclusions presented are those of the researchers and not necessarily those of the funding agencies.